My favorite things to 3D print are objects that come off the printer with fully movable parts and don’t require a huge amount of assembly or any messy glue. As time goes on, we are finding that there are more and more incredibly complex designs that people are coming up with for objects that previously were not even considered to be 3D printable. One man, named Elliott Viles, is quite the designer when it comes to creating 3D printed objects from scratch. His latest design is a German Panzer IV Tank. It is actually a 3D printable model kit, which does not take a rocket scientist to assemble. 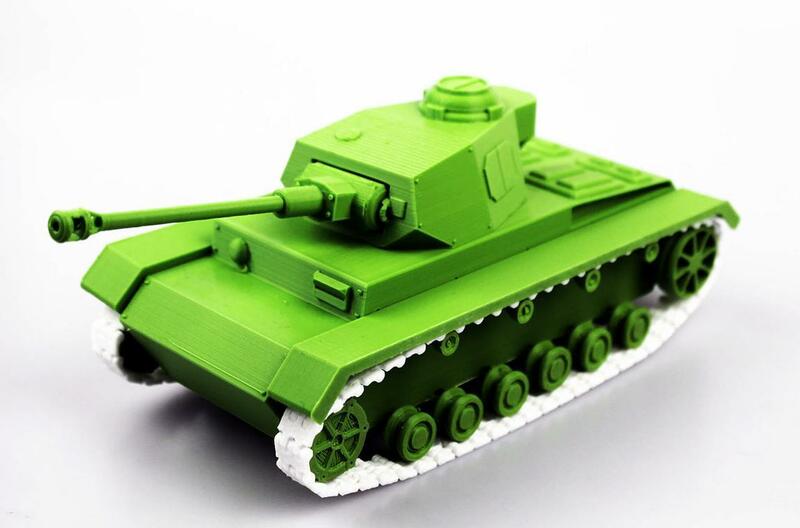 Viles designed his tank using Solidworks, and then printed it on his Ultimaker 2 3D printer using green PLA filament. The tank features a turret that has built-in bearings which allow for a full 360 degree rotation once it is mounted on the chassis. The cannon snaps into place and can be moved up and down with ease. Many of the other movable parts are printed into the tank and are ready to move around as soon as it comes off of the print bed. Viles laid out the orientation of the tank pieces so that he could eliminate the need for support material. This is sometimes a deterrent when people consider printing objects, and personally I love that he took this into account. He recommends that the tracks on the wheels be printed in a flexible filament such as NinjaFlex. What do you think about Viles’ design? Have you tried 3D printing it yet? Discuss in the 3D Printed Panzer Tank forum thread on 3DPB.com. Check out some more photos of Viles’ tank below.